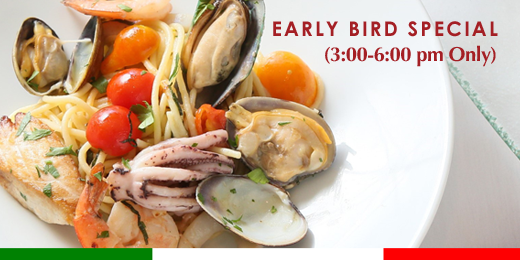 A special “Early Bird” menu is available nightly from 3:00 pm – 6:00 pm at a very special price. Featuring 3 course menu with a choice of salad, choice of pasta and dessert, price not combinable with other offers or discounts. Must be seated by 6:00 pm. then 10 or more in a group.